"A bit of air in here wouldn't go amiss." One of the more difficult directors to fully grasp, Michael Haneke, is, nevertheless, one of the most interesting auteurs in the international film circuit. His most recent movies (The Piano Teacher, Cach�) have really put him on the map, in a global sense, but it's his earlier works where the filmmaker truly shines. Beginning with his first feature, The Seventh Continent, Haneke has given us some of the most haunting moments on film. His unique, meticulously paced films can be very difficult to sit through, as they often feature extremely realistic, brutal imagery. 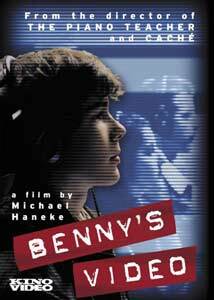 1992's Benny's Video, only Haneke's second feature, is no different, and raised the bar for what he could accomplish. It's a stirring portrait of the title character (Arno Frisch), a young boy who spends most of his time watching his enormous, very odd videotape collection. One video features a pig being killed by an electroshock gun. Benny can't get enough of this footage, slowing it down to watch the pig's final moments over and over again. He also frequents the local video store, where he invites an unnamed girl (Ingrid Stassner) back to his place. While the two are getting to know each other (and Benny's video collection), they decide to take a closer look at the same electroshock gun that felled the pig. If what I've told you about the director made any impression, you won't be surprised that it doesn't go well from there. The above only describes about the first 20 minutes, but any further plot description would give away far too much. Haneke's intimate filmmaking style practically has us in the room with Benny at all times, experiencing the dramatic turn that his life takes right along with him. Again, this is extremely tough material to experience, even in the comfort of your living room, but those of us who have been around the bend with Michael Haneke before know what we're getting ourselves into. While not as downright shocking as many of the moments in Haneke's brilliant Funny Games, the critical event near the beginning will stay with the viewer long after the credits have rolled. Much of this sequence takes place out of frame, but what we can see comes via Benny's video camera, and what we hear is even more unsettling. The consequences of this event, as well as the viewer's memories of its specifics, resonate throughout the rest of the story. Part of Haneke's genius is his ability to place such a powerful, life-changing event at the beginning of the film, when such a thing is usually reserved for the finale, or, at the latest, the half-way point. Where many filmmakers would have struggled to make the rest of their film competent, let alone entertaining, Benny's Video gets better as it goes on, becoming a tight study in potential madness and the lengths that parents will go to for their children. A young Arno Frisch (one of the intruders in Funny Games) is well beyond his years as Benny. It's amazing how a role requiring so little dialogue can be so powerful, especially from such a youngster. While Benny's parents, played by Angela Winkler and Ulrich M�he, stay mostly in the background and are arguably part of the protagonist's underlying problem, they eventually play a huge part in the story's outcome. Winkler plays vulnerable and motherly as well as any top-notch Hollywood actress, while M�he takes his white collar character and turns convention on its head. I'm eager to see if Haneke has done it again with Cach�, but after his masterpiece, Funny Games, Benny's Video runs a close second in his amazing body of work. Image Transfer Review: This anamorphic 1.85:1 widescreen presentation seemingly stems directly from a PAL source. Often, this spells disaster, but the majority of the visuals are pleasing. The only part that comes up short is the color rendering, with many of the hues slightly muted throughout. Image detail is nice, contrast and shadow levels are well-handled, and there isn't much in the way of dirt and grain. Audio Transfer Review: As with many of Haneke's films, the audio is all about either dialogue or silence. He doesn't feel the need for music, and tells a heck of a story with dialogue and ambient sound. Both of these elements are virtually flawless in this Dolby Digital 2.0 track. Extras Review: There are only two extras—a Michael Haneke filmography and a 20-minute interview with the director, in which he discusses the underlying message of Benny's Video, and how it stacks up to the rest of his filmography. A shocking experience best appreciated blind, Benny's Video proves provocative enough for weeks of analysis. It comes to DVD, along with a slate of other Haneke films, from Kino. The disc isn't as impressive as the film itself, but the audio and video are solid, and the interview with Haneke is interesting.